A 691-pound monster pumpkin arrived at Phillips Farm 13710 Schaeffer Road, Germantown, just in time for fall fun. 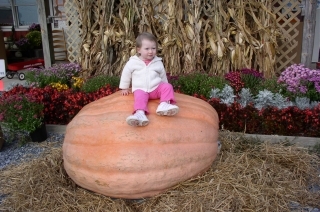 Jean Phillips said she always wanted to purchase a giant pumpkin for display during October, and this year decided to do it. She traveled to New York to find her beauty. The pumpkin is an Atlantic Giant variety. It is 54- inches long, 48- inches wide and 27- inches tall. The farm is accepting carving plans for the pumpkin and the winning plan will come to life Oct 30 when the pumpkin-turned-jack-o-lantern is lighted. While the carving is going on, every family will receive tow pumpkin seeds. Giant pumpkins could start sprouting in Germantown next September. Phillips is open 3 p.m. to dark on weekdays and 10 a.m. to 7 p.m. on weekends. The farm has animals, haystacks to climb and hayrides to the pumpkin patch. Call Phillips Farm at 301-540-2364.